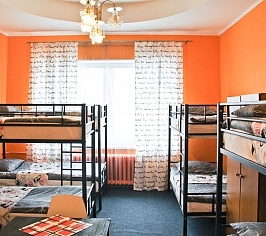 The biggest and centrally located hostel in Yekaterinburg - 3 floors with bright and spacious rooms and separate entrance from the street. the very center - crossing of Malyshev and Vainer str. Economy room for eight persons. Four bunk beds with orthopedic mattresses, wardrobe. Comfortable room for four persons. Four single beds with orthopedic mattresses, table, chest of drawers, coat rack, TV. Four single beds with orthopedic mattresses, wardrobe, table, drawer pedestal, TV. Four single beds with orthopedic mattresses, coat rack, drawer pedestal, mirror. Cozy room for one person. Single bed, chair, shelving, floor lamp, mirror. Cozy luxurious room for one person. Double bed, water, washing machine, TV. Cozy room for two persons. Double bed, convertible armchair, coat rack, table, chairs, mirror, clock. Two single beds with orthopedic mattresses, wardrobe, chest of drawers, table, TV. 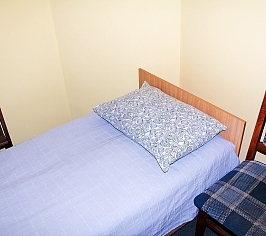 Comfortable economy room for three persons. Two single and one double bed with orthopedic mattresses, wardrobe, table, drawer pedestal, TV. Two single beds with orthopedic mattresses and sofa, tv, coat rack, drawer pedestal, table, mirror, clock. Comfortable room for three persons. Three single beds (one in separate room), wardrobe, table, TV. 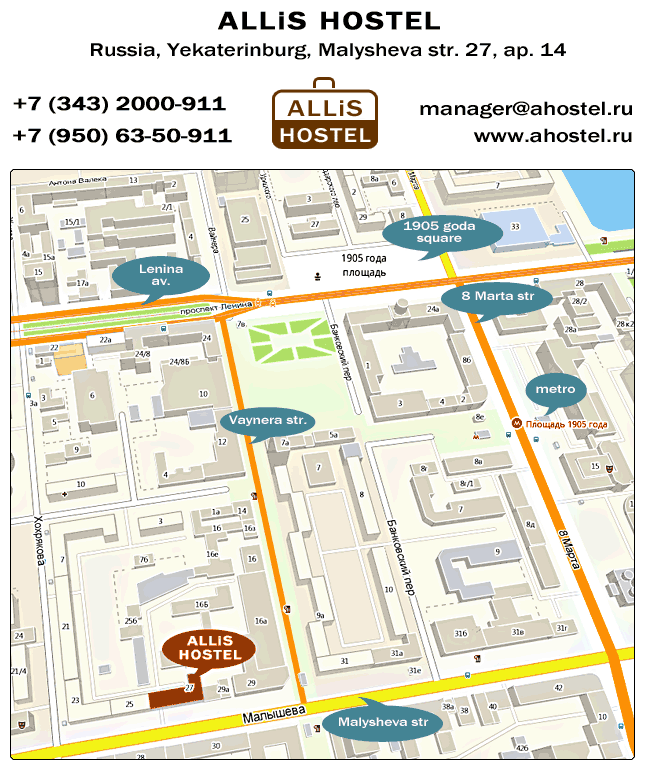 We offer you a non-expensive and comfortable hotel in the very center of Yekaterinburg. Square of 1905, shopping malls, restaurants and cafes are a few-minute walk from us. On the 1st floor of the building there is Em Sam cafe. A lot of transport: Square of 1905 metro station, bus, tram, trolley-bus, and commercial busses will help you to reach any point of Yekaterinburg. Our rooms are large and bright. Only beds with orthopedic mattresses and nice linen. Large bathroom will meet you after your trip. Hair dryer, iron system, washing machine are at your diposal. Kitchen is fully equipped with all the necessary facilities and dishes. Cozy and comfortable hall with TV and soft furniture where you always may spend your time. 24/7 room service - everything for your comfort. 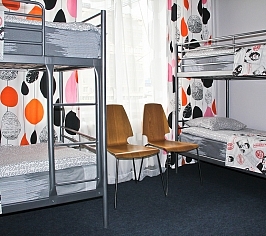 You will find all you need, friendly personnel and nice prices in our hostel. If you look for a place to stay - take our offer which is one of the best on price/quality ratio in Yekaterinburg.